When you think of toast, you likely picture a quick, no-frills breakfast item that’s easy to eat on your way out the door. But that’s what toast used to look like. Today, toast isn’t just toast. Crafting the perfect slice with a tower of toppings is a modern-day art form. There are websites all about toast, books written about toast, and innumerable Instagram pics capturing #toast from every angle. In the beginning, I wasn’t quite convinced this artisan food fad would last. After all, it was just . . . toast. But elevated breakfast bread is so much more multidimensional than the simple buttered slice. It can be a festive, savory starter for a dinner party, an indulgent brunch addition, and even a drool-worthy dessert. If you haven’t given this trend a try at home, you will be inspired by these playful recipes. 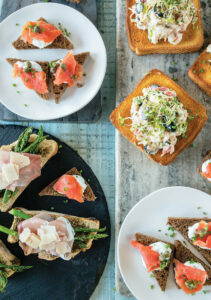 From starters to a main dish to dessert, I’ve got your toast-centric meals covered.